The city has tapped several community developers to build on a long-contested site dubbed the Broadway Triangle in South Williamsburg. They will create five new buildings that will include 380 apartments for extremely low-, very low-, low-income, and formerly homeless households. “After almost a decade in litigation, Broadway Triangle, one of the largest remaining City-owned sites in North Brooklyn, will soon start a new chapter as a mixed-use, affordable housing development with vital commercial, community, and open space,” said Acting HPD Commissioner Eric Enderlin. The deal comes more than a year after the city settled a lawsuit that claimed a previous plan favored the Hasidic community. The new development team is Unified Neighborhood Partners, which includes St. Nicks Alliance, RiseBoro Community Partnership, Southside United Housing Development Fund Corporation – Los Sures, United Jewish Organizations of Williamsburg (UJO), and Mega Contracting. “The Broadway Triangle project will allow longtime community based organizations unified in their commitment to real affordability to develop these four sites with people and environment in mind,” added, said Juan Ramos, Executive Director of Southside United- Los Sures. Each of the five buildings are planned to be designed to achieve Passive House certification. The proposal also includes development plans for landscaped courtyards, a plaza, and programmed rooftops. The project is expected to receive financing through the City’s Extremely Low- and Low-income Affordability (ELLA) program. The apartments will include a mix of studio, one, two, three, and four bedroom units. In addition to affordable apartments, the buildings will include over 10,000 square feet of community and commercial space which is expected to include a a non-profit coffee shop that employs at-risk youth, shared, flexible community space and a workforce development center operated by St. Nicks Alliance in over 7,000 s/fof community facility space. Site A located along Flushing Avenue and Bartlett Street. will include 78 units; Site B, mid-block along Bartlett and Gerry Street, will include 170 units across two buildings; Site C, along Throop Avenue between Bartlett Street and Gerry Street will include the construction of one building with 139 units. “After years of fighting to ensure that the development of public land within the Broadway Triangle will not favor any singular community of Williamsburg, I am thrilled to know that a cohort of long-serving North Brooklyn non-profits will be using the land to develop affordable housing. This is a victory for all of North Brooklyn and it marks a new chapter of development in this city where nonprofit community focused developers are prioritized over big real estate. 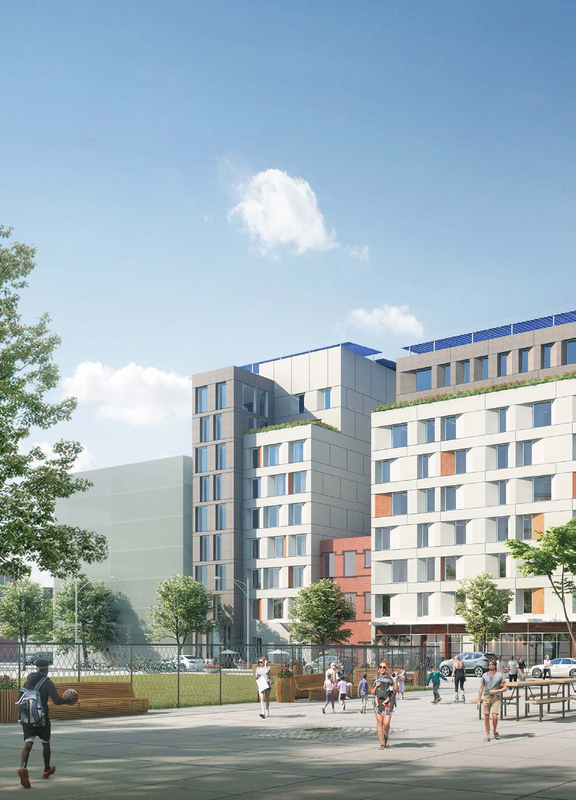 I applaud each of the organizations that partnered to make this a reality and I look forward to seeing shovels hit the ground on this project,” said State Senator Julia Salazar. The Rabsky Group will include 287 permanently affordable units in its development of the two bock area between Harrison and Union Avenues. That development will feature eight mixed-use buildings with 1,146 mixed-income residential units, 65,000 s/f of retail, a half-acre of public open space, and 405 parking spaces.